I have some catching up to do! 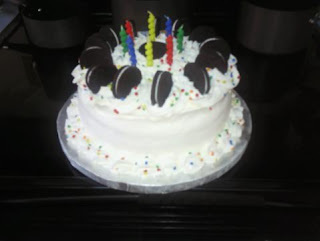 I finally got the pictures off my phone onto my computer, so here's the ice cream cake I made for my husband for his birthday in September. 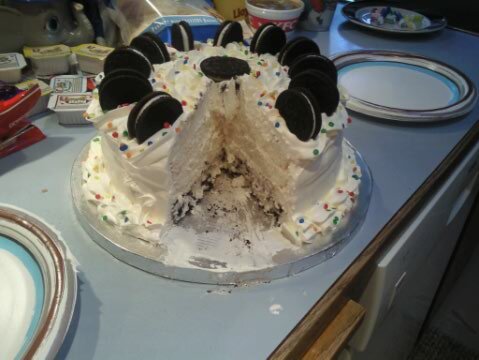 It was two layers of ice cream and one layer of white cake with whipped topping and oreo cookies. It was delicious, easy to make, and so much cheaper than Baskin Robbins. I also tested cake mix to make domed cupcakes to be dipped in poured fondant. I also used this same post from Louise's Cake Journal website as inspiration for the flowers & leaves on my Devil's Food cupcakes below. Betty Crocker mix versus Duncan Hines. I have always been steered towards Duncan Hines, but one week they were out of white mix so I grabbed Betty Crocker. The cupcakes came out very domed without my even trying. I wanted to be sure so I tested it, the winner is Betty Crocker for domed cupcakes! I made a test batch of Devil's Food cupcakes with Chocolate Fudge Icing. I made rolled pink fondant roses and leaves using marshmallow fondant. They were delicious, but the cake was very light and fluffy, I need to find a dense chocolate cake recipe. This icing dries thick and is very rich. I don't think it's too far off actual fudge. Sift cocoa and powdered sugar separately to prevent lumps. Melt butter over medium heat, add cocoa and heat just until bubbles form. Pour into mixer bowl and cool slightly. Add powdered sugar and milk, alternating, beat until smooth. Add vanilla, beat until fluffy.